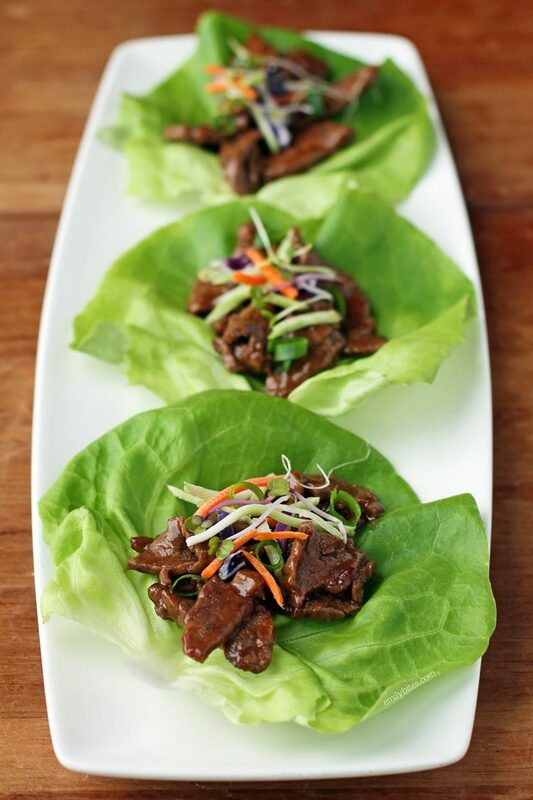 My husband and I both loved these Teriyaki Steak Lettuce Wraps. They are easy to make and they taste really fresh and flavorful. For those of you who love my Teriyaki Chicken and Rice Casserole, these wraps use a very similar sauce, but with steak. I thought these were great for an easy weeknight dinner and the leftovers were perfect for lunch the next day. Plus, three of these wraps are just 233 calories or 5 Weight Watchers Freestyle SmartPoints! That’s a bargain! I topped these with scallions, broccoli slaw and sprouts, but you can certainly change that up based on your preferences. Feel free to add water chestnuts, shredded carrots, sliced snow peas or whatever else you prefer. Looking for more tasty, lightened up steak recipes? Check out my Strawberry Steak Salad, Open-Faced Greek Steak Sandwiches, Southwest Steak Salad with Avocado Lime Dressing, Beef Stroganoff, Spicy Steak Tacos with Southwestern Guacamole, Black and Blue Steak Wraps, Spinach and Feta Stuffed Flank Steak and more in the Beef category of my recipe index! Combine the soy sauce, the ¼ cup water, the brown sugar, honey, ginger, ½ teaspoon of olive oil, and garlic in a small saucepan and cover. Bring to a boil over medium heat. Remove lid and cook for one minute once boiling. Bring one tablespoon of oil to medium heat in a large skillet. Add the steak strips and stir to coat with the oil. Cook, stirring and flipping occasionally, for about 5 minutes until the steak is cooked to taste. Add the teriyaki sauce you made from step 2 and stir to coat. Cook for another minute or two and remove from heat. 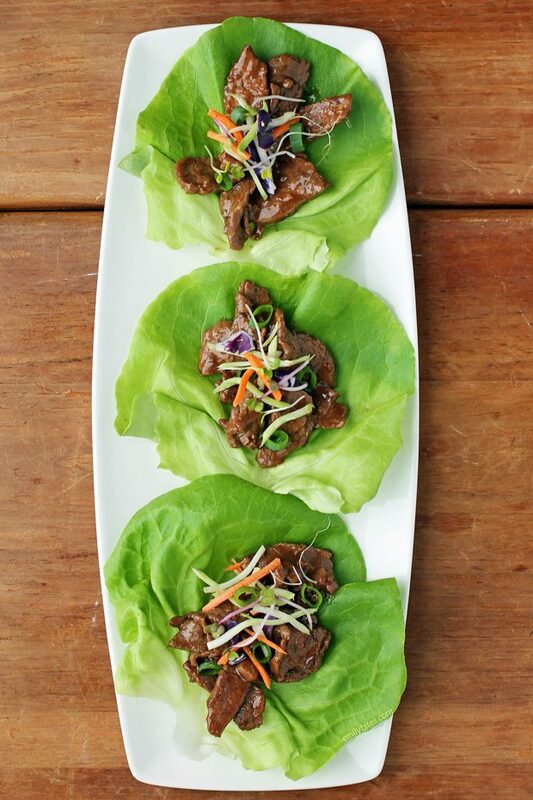 To build the lettuce wraps: each serving is about 3 1/3 oz steak, so put a little over an ounce of sauced steak into each lettuce leaf. Top each with a sprinkling of scallions, two teaspoons of broccoli slaw and a sprinkle of sprouts and serve. One serving is three lettuce wraps. Those sound really good! Nice picture/presentation! Made these for the family tonight. Got lucky because the butcher was willing to cut the meat into strips for me. Delicious and picky eater approved! They’ve already asked for it again. Thanks! Am I reading it correctly that 1 serving size is 3 wraps? So the nutritional information is for 3? This marinade was sooooo good! It’s our new go-to!! Because I am so lame on stuff, how do you eat these?? Pick them up?? I’m actually making them tonight and I guess that is what we’ll do but I just wondered what ‘classy’ people do!! Love all your stuff!! Thank you!